Sometimes all those kitschy-themed slots are just too much. Click here to play! Sometimes you just want a classic slots gaming experience that offers great payout opportunities. If this is you then look no further because Double Gold is the game for you! Set in a standard but graphically beautiful slots casino, Double Gold is a 3-reel, single pay-line slot that has three different pay out amounts for every winning combination. Similar to many classic slot machines, you can choose to bet 1, 2 or 3, coins on every spin. For example, if you bet 3 coins and won on three 7s you would be paid out 240 times your original wager; however, if you had bet 1 coin on that spin instead of 3, you would only be paid out 80 times your stake. The Double Gold symbol is Wild and completes every winning 3-symbol combination. If there is one Wild in the winning combo your payout will be doubled, and if there are two then the payout will be quadrupled! There's nothing better than playing a traditional slot machine, and Double Gold is one of the finest. So journey back to the good old days right now and immerse yourself in the winning ways of classic slots! 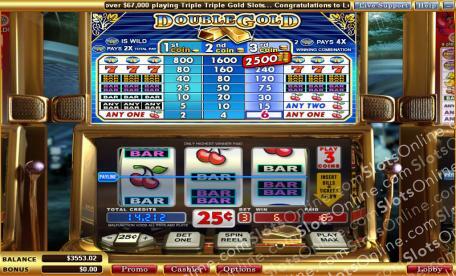 The Double Gold symbol will complete any winning combination as well as increasing the payout. If 1 Double Gold Wild symbol is in the combination, the payout will be doubled; and it will be quadrupled if 2 symbols appear.